The world’s only Abalone Festival & Cook-off is happening this weekend, Saturday, October 6. Chefs are competing for a week’s vacation in a Yucatan villa, so they’ll be cooking their hearts out for you. They are fellow abalone lovers, so you know they have a few secret recipes up their sleeves. Since abalone is not available for sale or in restaurants, this is your chance to sample this delicacy. Chowder tasting, a craft fair, and music round out this fun event. Caspar Community Center from 10 a.m. to 4 p.m.
I’m not sure how much time–maybe three years– has gone by since a contigent from the Point Cabrillo Lightkeepers Association moved the Baltimore Brig Frolic’s cannon from the Kelley House Museum and shipped it to Indiana University in Bloomington for preservation. “Preservation” means creating an electrolytic reduction bath that neutralizes the damage caused by being in salt water, then exposed to the air. The idea is to stop further deterioration. The Frolic, one of the most significant Gold Rush-era shipwrecks, which led to settlement and lumbering on the Mendocino Coast (that’s another story), was damaged and run aground in 1850 just north of the Point Cabrillo Lighthouse. 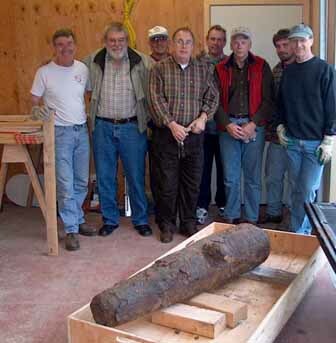 The cannon was a major artifact find. And Caspar resident Win Bowen built a sturdy wood and plastic display case to show it off in the lighthouse. Unfortunately, not long after he completed the display case, the decision was made to send the cannon east for preservation work. Word just back from the preservation folks: “It’s a slow process and needs another year of electrolytic bath” because of its size. Considering its value and potential for educating future generations, 12 months is really not that long to wait. Win Bowen, far left above, designed the special display case waiting for the Frolic when it is possibly returned to Mendocino in 2008. Others pictured: Harold Hauck, Bob Ellington, Ron Eich, Jack Sherin, Jim Kimbrell, Tony Scramaglia, and Bruce Lewis (that’s me) on the day we hauled into into a truck for the move to Point Cabrillo. My picture is date 11/13/03.